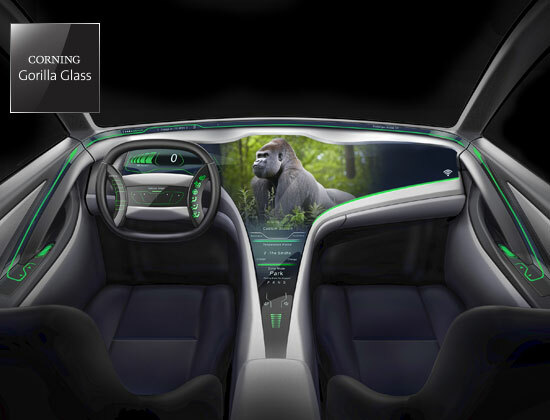 Corning’s new Gorilla Glass for Automotive Interiors solutions are designed to address new trends, as automakers respond to consumer demand for more integrated and interactive displays. Michael Kunigonis, vice president and general manager, Corning Automotive Glass Solutions explains that Consumers want a more connected and immersive driver experience in the cockpit. Automakers are responding by deploying displays that are larger, longer, shaped, and more integrated. Corning scientists have developed the industry’s first two AutoGrade™ cover glass solutions for auto interiors, in two-dimensional and three-dimensional formats. The 2D cover glass is optimized to pass industry reliability tests (using Corning’s system-level design guidelines) 99% of the time, while preserving its authentic feel, superior durability, and advantaged optics for flat applications. Corning’s 3D glass was developed for shaped or curved applications. It delivers the same reliability performance, when bent to shape, as the 2D cover glass. AutoGrade™ Corning Gorilla Glass for Automotive Interiors 2D and 3D will be available for mass production in 2019, with automakers already working it into their designs for the 2020 model year.